Following the much delayed BlackBerry PlayBook 2.0 update, the tablet finally has a native email client, other PIM apps and a larger selection of apps thanks to its Android player. Research in Motion is now looking to further boost interest in its debut slate, and it has announced the BlackBerry Mini Keyboard for those users looking for a physical keypad option on top of the virtual one. The accessory retails for a lofty $119.99 and is available for pre-order starting today, with shipments going out on March 23rd. The concept of the keyboard is similar to the competition. It includes a multitouch trackpad for browsing, a keyboard for easy input and a battery that last up to 30 days. 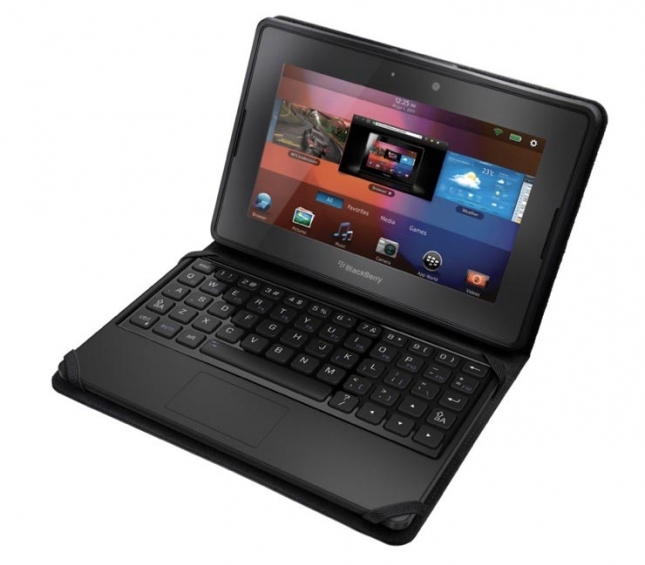 Unlike the ASUS Transformer Prime, RIM’s accessory does not have a docking feature and is just a carrying case with an integrated Bluetooth keyboard.